On The Marquee: A Pirate Meets The Thin Man! A Pirate Meets The Thin Man! So I think maybe I’m a little psychic. Or maybe just super intuitive. 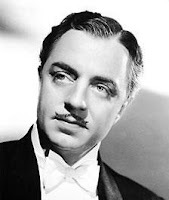 Way back in February of last year I wrote a post about franchises, focusing specifically on The Thin Man series and also referencing the shoulda-stopped-after-one Pirates of the Caribbean series. Little did I know over a year later these two franchises would be magically combined! How is this mash-up possible you ask? Picture Johnny Depp as Nick Charles, the cocktail-sipping, fast-quipping detective originated by William Powell, and you’ll get what I mean. According to the Hollywood Reporter, it seems Warner Bros. is remaking the 1930s-through-40s franchise (six films over 13 years) with Captain Jack Sparrow himself in the lead role. Word is, Depp’s been trying to convince his Pirates 4 director Rob Marshall to direct him on this film too. Mind you, all of this is still in its early stages - there’s not even a script yet. But it’s an interesting prospect, no? We already know Depp has wit and swagger - plus he can rock a thin mustache. Who do you think will snag the role of Nora, Nick’s sassy, wealthy wife and partner in solving crime, originally played by Myrna Loy? Cate Blanchett? Or am I just saying that because I believe she can do no wrong? Two franchises merging into... a remake. Hollywood's really working overtime, isn't it?